With 3.5 million sold to date around the globe and deity status in California and other green municipalities like Ann Arbor, the Prius is one of the most important automobiles in history. That makes the release of the all-new 2016 model A Very Big Deal. Prius has become its own sub-brand. Since it went on sale in January this year, Toyota has already booked 18,600 Prius sales including leftovers and the 2016. This is 3,000 more units than Chevrolet recorded for the Volt all 12 months last year. By the end of March, it will have outsold what’s projected for the 2017 Volt this whole year. The Prius crushes every alternative energy car out there in that beauty pageant that means the most to the automakers – market acceptance. It beats all alternative energy cars from Honda, Ford, Hyundai, Kia, Volkswagen, BMW, Audi, Mercedes, Lexus, Infiniti, Mitsubishi, Volvo, Nissan, Tesla, you name it. Since its Japanese launch in 1997, the Prius has accounted for more than 3.5 million units in the 90 markets around the world in which it is sold. The Prius will likely continue to dominate for some time to come. The 2016 Prius is lower, longer and a bit wider, with a very stylish remodeling of its body panels to reflect the current vogue in aggressive appearance. 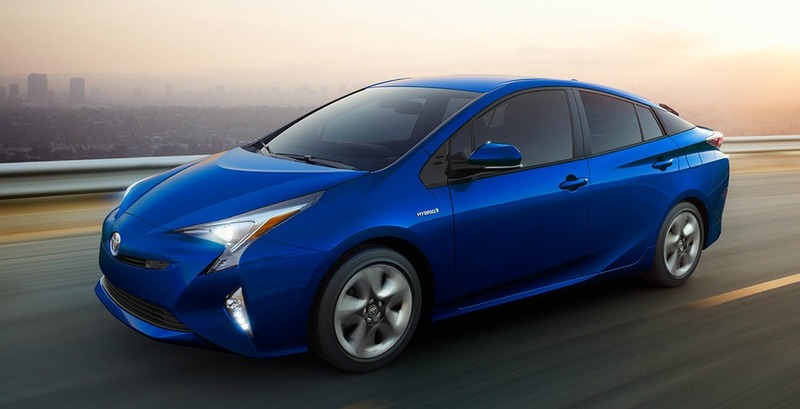 LED headlights and taillights bring the Prius up to speed with other new cars and style. All this on top of Toyota’s new TNGA (Toyota New Global Architecture) platform using higher strength steel, greater rigidity and a new multi-link rear suspension. This and the relocation of the batteries from under the trunk – to under the rear seat and many other weight reduction points has lowered the center of gravity about an inch. The handling is crisp and the ride a bit stiff, but in the range one expects of a small car. Overall the handling is improved over generation three. Turning radius is tight – such that a circle can be made within two parking spaces end to end. The interior has been redesigned as well. Done mostly in a soft-touch plastic in two-tone colors and accents, the dash is pleasant to look at and blends into the door panels. The usual touch screen is in the center with the real-time driving and performance information on a narrow screen centered at the base of the windshield. An optional heads-up display will put this information on the windshield before the driver. Rear seats are comfy with adequate legroom for adults. The steering wheel and its controls are excellent and adjustable to get a good driving position. Trunk area is increased by three cubic-feet due to the lowered floor. Gone is the spare tire, replaced by an inflator kit. Come by Elmhurst Toyota and see what all the fuss is about.